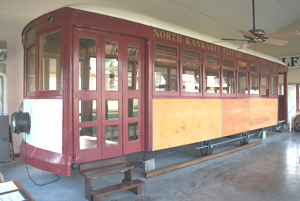 Our trolley was number 414 and was operated by the North Kankakee Electric Light & Railway Co. They sold the extra electricity to the City of Bradley. 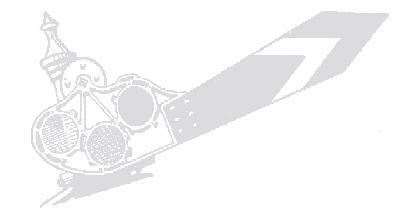 The company was organized in 1892. 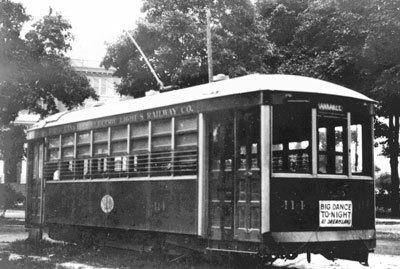 Our trolley was built in 1932 by the McGuire-Cummings Co. It was a light weight single truck trolley. 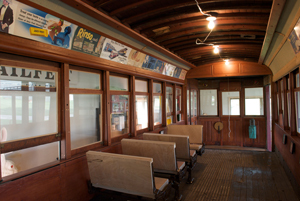 This trolley ran in Kankakee from 1916 until 1932 when this trolley was replaced with buses. It ran a north-south route from Merchant Street, in Kankakee, to Olivet University (former St. Viator's College), in Bourbonnais. There was a separate trolley company that ran the east-west routes in Kankakee. 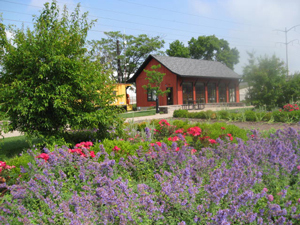 We have been working on its restoration for 4 years, and about one year of this time was spent building the trolley barn to protect it from the weather. It is 95% wood, and it was used as a motel during the World's Fair in Chicago 1933-34. It was later used as a carpenter's workshop, and finally just for storage.